The most spirited visitors to Terre Haute, Ind., since Larry Bird played college basketball there in the late ‘70s were at Indiana State University last week. There, more than three dozen student leaders from 20 universities attended the inaugural convention of the National Collegiate Student Section Association. 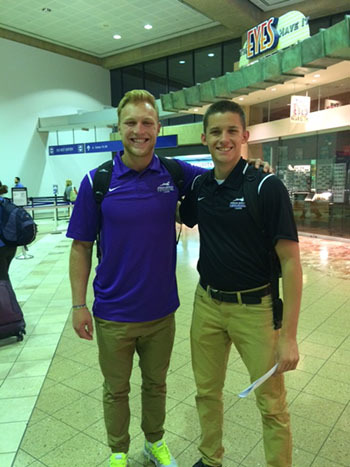 Senior Brandon Kaiser, the Havocs president, and junior Trevor Knotts, vice president of the Lopes rowdy student section, joined others from small schools (D-3 Hope College) and giants (University of Arizona) at the three-day meeting. Kaiser and Knotts attended sessions about finances, social media and ethics and gave a presentation on GCU’s spirit strategy. Kaiser, a member of the NCSSA’s executive board, also led a discussion on marketing. “The goal is to build bridges, create relationships and mutual respect, to display school pride and support of our athletic programs and to build camaraderie among students,” he said. The GCU pair also participated in the conference “swap shop,” handing out Lopes T-shirts, drawstring bags, hats, flags, stickers and other gear, and brought home swag from the other universities. The NCSSA was launched last year by Jacob Pauly, a student at the University of Colorado Boulder, and Austin Jacobs, a student at the University of San Diego. Kaiser said Jacobs was amazed that GCU has brought 600 student leaders to a basketball tournament in San Diego during the 2013-14 season. It was almost as impressive as the hilarious costumes, creative routines and nonstop noise the Havocs are known for generating during basketball games in GCU Arena. GCU hopes one day to host a NCSSA convention on campus. We like the Havocs’ chances.